There's no question health care costs take a big chunk out of workers' paychecks. But try to take solace in the fact that premiums are rising at modest levels, at least compared to a few years ago. That's the finding of the 2016 Kaiser/HRET Employer Health Benefits, released Wednesday. The annual report offers a look at how much people are shelling out for coverage and care under work-based plans. The average family plan cost $18,142 this year, up 3.4% from 2015, the study found. That's faster than both wages (up 2.5%) and inflation (up 1.1%). Workers may grumble, but their payments only cover an average of 30% of the bill, or $5,277. Employers picked up $12,865. Employees are paying a whole lot more for health insurance than they did a decade ago. The average family plan cost $11,480 in 2006, of which workers had to pay $2,973. 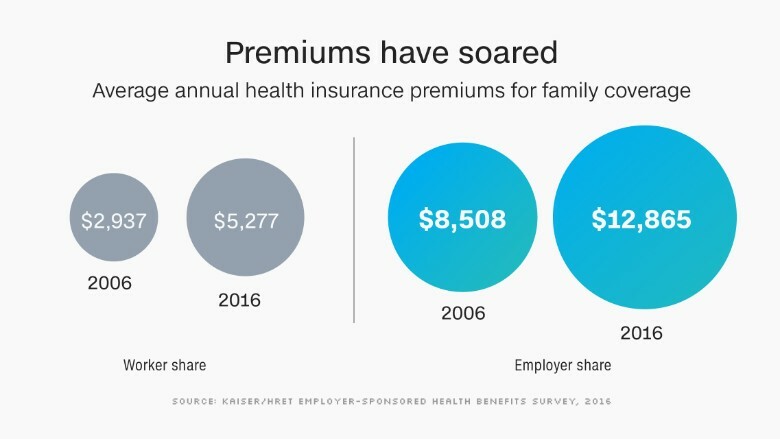 This annual premium increase in workplace coverage is far lower than is what expected on the Obamacare exchanges in 2017. But the double-digit increase predicted for many Obamacare plans isn't related to the rising cost of healthcare -- it's largely because insurers initially priced their plans too low. Americans are also paying more to see the doctor or get a lab test. 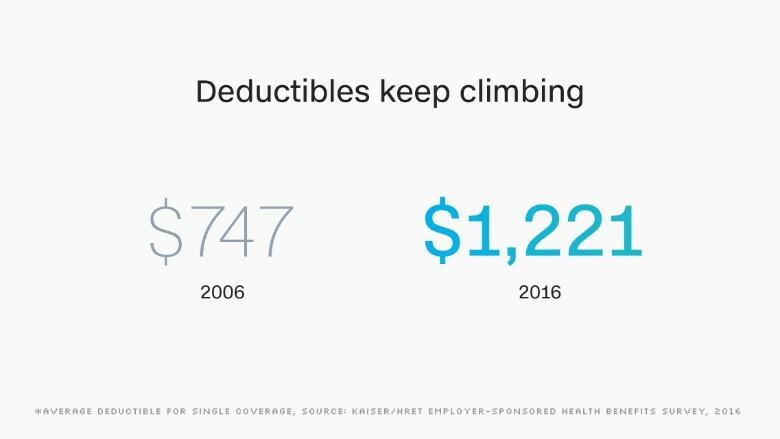 In fact, more than than half of employees now have to shell out at least a grand in deductibles even before their coverage kicks in. 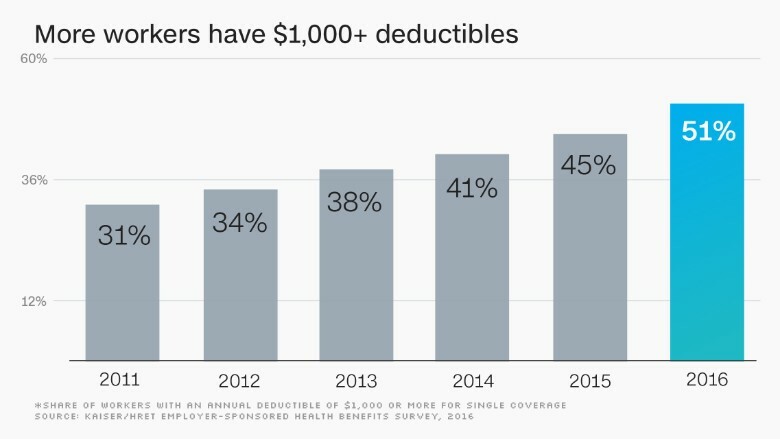 Some 51% of workers face deductibles of at least $1,000 for single coverage, with the average deductible hitting $1,221. Workers at small firms of fewer than 200 workers are more likely to have higher deductibles. 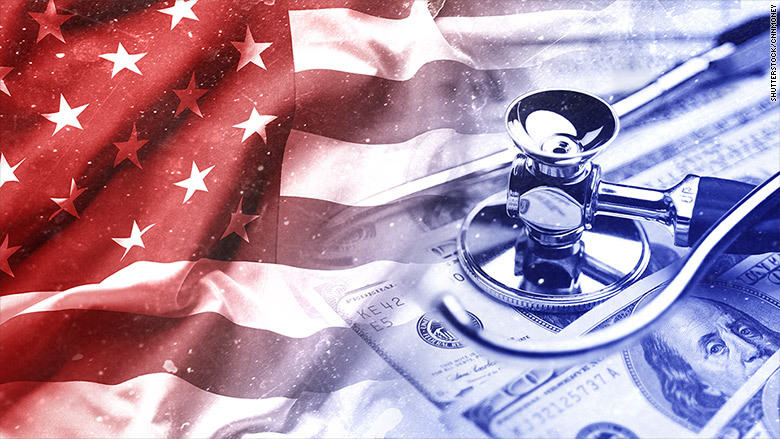 High-deductible plans have been growing in popularity in recent years, as employers seek to shift more of the cost to their staff and keep premium increases at bay. Also, these stiff up-front costs force workers to think twice about accessing unnecessary care and to shop around for less expensive providers. "It encourages workers to make good choices," said Gary Claxton, director of Kaiser's Health Care Marketplace Project. More and more employers are also linking high-deductible plans to savings or reimbursement accounts to help workers handle the cost of care. These types of plans have soared to 29% in 2016, up from 20% two years earlier. Companies contribute to these plans and that money can be used to cover bills before the employee hits the deductible. Those at firms with at least 50 co-workers are very likely to have health insurance offered at their job. 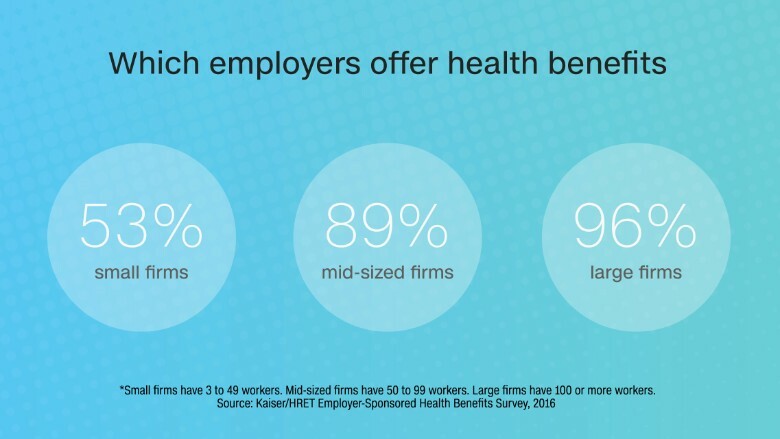 Some 96% of companies with at least 100 workers and 89% with at least 50 workers provide coverage. At smaller employers, it's more rare. Only 53% of companies with three to 49 staffers offer benefits. The share of companies offering coverage has been drifting downward for years, driven largely by small firms. It predates the passage of Obamacare in 2010, which some thought would prompt employers to dump their workers on the individual exchanges. That actually hasn't happened. Also, there's little evidence that Obamacare has led employers to reduce workers' hours. In fact, more companies say they are shifting workers to full-time status so they can sign up for benefits (7%) than report they are reducing hours (2%).